Makita EK8100 16" Power cutter has tool-less access to the pre filter which allows for easy cleaning for the user. It also has tension springs in the clutch which extends the life of the clutch. 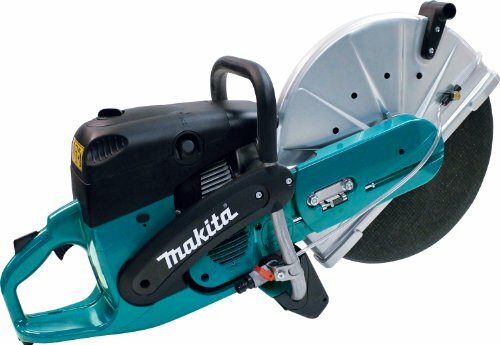 Makita uses a 120MM fly wheel with 28 vanes for optimal air routing, this allows for longer engine life, better combustion and less likely hood of seizure. It's cutting arm position changes simply from center position to flush (outboard) position allowing cuts directly adjacent to curb edges, wall or directly above ground. Water kit assembled to saw for use with garden hose, dolly and gravity feed tank (DT2010 sold separately).